1. 100% free software. No advertisements and no limited versions. 2. More than 500 utilities! 3. Video tutorials for every tool. 4. Free and unlimited technical support. 5. Automatic “on line” updates. 7. 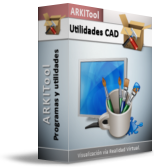 Compatible with ZWCAD and other CAD sofware. 8. Attractive and intuitive interface with icons for every command. 9. Tool bars for every utility. 10. It does not modify your CAD software. Work in the same way! 11. Make several operations in different files simultaneously.